Here's a case where the band name might not ring any bells, but the names of some of the musicians attached to it certainly should! Granted that might not be the case when you look at Warrion's founding member, guitarist Ron Ravi (Who? ), but move on past him and you've got the one and only Michael (Mike) Vescera (Obsession/Ex-Loudness/Ex-Yngwie Malmsteen) handling lead vocals! How Ron Ravi (Again, who?) manged to pull that one off I'd really like to know. In addition to Mike Vescera you also have guest vocalist George Call (ASKA, ex-Omen) stopping by to lend a hand on the mic. Between those two vocalists there's very little to critique when you're talking about the front-man position so let's take a peek at the other musicians involved here. This straight-laced U.S. metal band also features lead guitarist Tim Thomas (Abattoir/Ex-Agent Steel/Ex-Steel Prophet), bassist Keith Knight (Aska) and drummer Rob Brug (Halloween/Ex-Damien). Not too bad of a band-lineup is it? While I'd hesitate to say that Warrion has a lot of star-power going for it, as Mike Vescera is probably the only real "star" here, there's still a TON of talent surrounding founding member Ron Ravi! And speaking of talent, it would be so wrong to ignore the contributions from keyboardist Dave Hermien Dufort. He might not provide additional "star power" on Warrion's debut-album, but his skills are just as appreciated. So, do you find yourself now wondering what it is exactly that you get when you combine all this talent? Well, that my friends is the million dollar question isn't it? 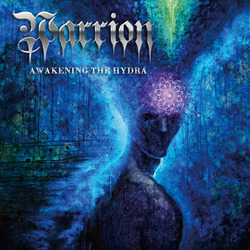 The short answer to that question would be that when it comes to U.S. metal act Warrion, and their debut-album "Awakening The Hydra", you can expect solid, if nothing overwhelmingly exciting, heavy metal that similar to Mike's other bands. And that is the funny thing about Warrion. Overall this album sounds like a collaboration between Obsession and Loudness while it also bares a very slight resemblance to the likes of Omen. So it is, in a real way, every bit of it's various pieces sewn together. There are some European power metal influences sprinkled here and there as well (as well as other, older U.S. power metal bands then the ones mentioned above), but to their credit the members of Warrion go out of their way to keep things, more or less, original. They also aim for upbeat and exciting U.S. heavy metal with maybe one or two exceptions. And, seeing as it comes wrapped up nicely with a really good production aiding it, it does achieve the desired affects. Warrion are clearly going after old-school heavy metal/U.S. power metal fans with "Awakening The Hydra" and that type of crowd should eat this one up. Whether this is a full-time gig for Warrion or simply a one-time, studio-only deal remains to be seen. For a first draft though this album shows promise so here's hoping that Ron Ravi can keep Warrion going in one form or another!